The decree that reinstates prohibition for legal drugs as well as the overall structure of Duque’s anti-narcotics policy in Colombia is rooted in a moralistic outlook rather than a result of comprehensive policy-making. It will do little to curb drug trafficking or consumption, but it will succeed at giving the police greater leave to become a repressive arm of government. Also, the policy shows an amazing lack of global perspective. As countries around the world are loosening restrictions on certain drugs–going as far as to completely legalize recreational consumption–Colombia seems to be going in the opposite direction. Last week, president Iván Duque signed a decree which allowed police to confiscate any drugs from individuals who are carrying the legal amount of drugs, also known as a personal dosage (Newsflash: carrying small amounts of drugs was legal in Colombia until last week). According to the law, individuals are allowed to carry certain amounts of drugs for personal and recreational use. This policy initiative had been approved by the Constitutional Court of Carlos Gaviria, later a left-wing presidential candidate, under the constitution’s protection of an individual’s rights to freely develop their personality. Some would call the Court’s 1994 decision extremely hypocritical as it legalized drugs for personal consumption while at the same time the country engaged in a bloody war on drugs. Others would say, however, that in hindsight the ruling came well before its time. The decree is an effort by Duque to more aggressively fight drug trafficking as well as drug consumption, which the ruling Centro Democrático party argues has increased significantly. While it is true that Colombia’s drug cultivation numbers have increased significantly since 2014, consumption amounts however have not increased at a rate significantly higher than similar-sized countries. What many countries around the world have understood is that prohibition does not work. It does not work for gambling, it does not work for alcohol, and it does not work for tobacco. Why then are they under the impression that this time, it will work for marijuana? The Colombian government’s efforts would seem out of step to outside observers. Internationally, there seems to be a change of heart towards drug consumption, especially marijuana. Governments around the world have begun regulating drug consumption, treating it as a public health issue rather than a criminal justice issue. States and local governments have promoted harm-reduction efforts such as needle exchange, rehabilitation and mental health programs. Medical cannabis was approved in California in 1996, since then the substance is legal in more than 31 States, as well as the District of Columbia and Puerto Rico. Moreover, recreational marijuana has been legalized in other US states such as Colorado, Oregon, California, Washington, Alaska and Vermont, although the drug is still prohibited at the federal level. Court rulings in Georgia (the country) and South Africa have loosened enforcement of personal cultivation. The drug is fully legal in Uruguay and Canada (effective on 17 October). Other countries such as The Netherlands, Spain and Portugal have a policy of limited enforcement where the sale of cannabis is tolerated at licensed establishments. Why, then, is Colombia rowing against the stream? The answer is not rooted in public policy, but in morality. The prohibition of drugs will bring ease to parents who want the government to do more to protect their children. Never mind that it has been proven time and time again that alcohol, sugar, and tobacco, are significantly more harmful to public health of teens, and later adults. Protecting the children, or for that matter the public health of Colombians is not the issue here. What is at stake is the government’s image as tough on crime. The decree allows for authorities to make headlines and give the false impression that there is progress by touting drug seizures and imprisoning people, yet it will do little to curb drug trafficking or consumption. Licences to sell medical cannabis oils was introduced by the previous administration. Medical and recreational marijuana however will now be prohibited in any amount. The issue with drugs can be boiled down to economics. The demand for drugs is constant, or inelastic, as they are addictive substances and consumers will be willing to pay for the substance regardless of an increase in price. Although US anti-narcotics authorities use diminishing production statistics and growing street prices as success indicators, the truth of the matter is that consumers will seek out drugs, and if they are priced out, they will find other substances with which they can get high. I’m not going to cite long econometrics papers to prove my point (although I am sure there are many). At the same time, production of drugs be it marijuana or coca is not likely to drop any time soon. As long as producing illegal crops is higher than growing legal commodities such as yuca, plantains, coffee or rice, rural farmers will be incentivized to grow illegal crops to supplement their income, or to abandon legal crops altogether. Moreover, the pricier drugs become, the more crops will be planted to meet that demand, this is also known as an elastic supply. 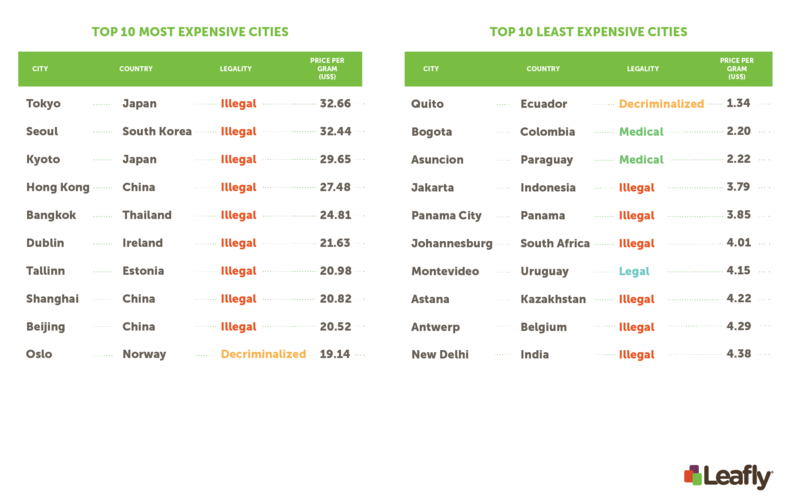 This is particularly relevant when considering what one single gram of marijuana costs globally, versus in Bogotá. Anti-narcotics policies have weakened civilian institutions in Colombia by focusing on military and security efforts instead of economic, judicial and social restructuring of rural areas. Drug policies have weakened Colombia’s national institutions by over-funding the military and the police – who are often accused of colluding with drug criminals themselves. What is also salient are the revenues that the state fails to collect from drug sales. Some researchers estimate that the income Colombia receives from the drug trade lies between 1.5 and 25 billion dollars. The amount of money is not insignificant considering that Colombia’s total estimated GDP is USD 714 billion (2017). If Colombia could tap into those revenue flows (by legalizing drugs, that is) and significantly taxing them, the country could easily alleviate the budget deficit and find funding for comprehensive public health measures that focus on harm reduction. Unfortunately, it seems that there will be no amount of corroborating evidence that will provoke a change of heart from Duque or the Centro Democrático on drug prohibition. But it is very likely that they are well aware that the policy will not curb trafficking or consumption, but will instead incarcerate a lot of people mostly hailing from poor backgrounds. Prohibition is not going to solve our problems, neither is legalization. But it is completely obtuse that the government – which boasts to be reasonable, technical and evidence-based – seeks to implement a policy more akin to 1972 than to 2018 and consider it a public service. While Duque continues facing external pressure to curb drug production and consumption at home, we can expect little to no progress on this front.